BMW has decided that Mini has become too big and will shrink the compact brand’s line-up to five models from eight. The move reverses course after Mini rolled out a series of quirky derivatives such as the coupe and roadster two-seaters in recent years. While that strategy sustained sales growth, it added cost and complexity. Over the long term, Mini will now focus on “superhero” vehicles like the three- and five-door versions of the basic hatchback, the Countryman crossover and the Clubman wagon, which will be revamped next year, Peter Schwarzenbauer, the brand’s chief, said last Wednesday. BMW re-introduced Mini, a 1960s-era British icon, as an upscale compact in 2001 to target increasing numbers of well-off urban consumers. Since then, there’s been a steady stream of trendy city cars such as the Audi A1, Fiat 500 and Nissan Juke, putting pressure on Mini to differentiate itself. “Mini now faces competition in areas where it previously stood alone,” said Schwarzenbauer, who took charge of Mini last year after previously heading sales at Audi. Three to four current models will retain their place in the brand’s line-up, which now includes the two-door Paceman crossover and a convertible. He didn’t say which Mini models will be cut and didn’t give a timeframe. It’s not all backpedalling. Mini will offer an electric vehicle “soon” as zero-emission driving will likely become a must in many downtown districts around the world. An electric car could be modelled on the sleek Superleggera concept showcased at the Paris Motor Show in October. 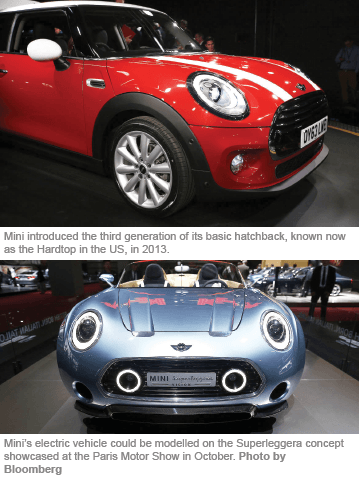 Mini introduced the third generation of its basic hatchback, known now as the Hardtop in the United States, in 2013. Demand for the car will help the BMW unit match last year’s sales record of about 305,000 vehicles. With the addition of the new Clubman, Schwarzenbauer anticipates a “significant” increase in sales next year. In addition to revamping its line-up, Mini is looking at more customisation options and alternatives to sales through traditional dealers. This article first appeared in The Edge Financial Daily, on December 4, 2014.